Yesterday at breakfast, accompanist Carl Landa was telling me that the word for dance and the word for music are the same in many African countries. This one word is used to encompass the act of dancing, music making and storytelling. This fluidity between music and dance is constantly emphasized during our classes here. Almost all classes are accompanied by live music. These fantastic musicians come from many different backgrounds and all have impressive resumes that include playing MANY different instruments, dancing, composing, touring, and teaching (often to dancers). You can read the accompanists bios to learn more about where they come from. 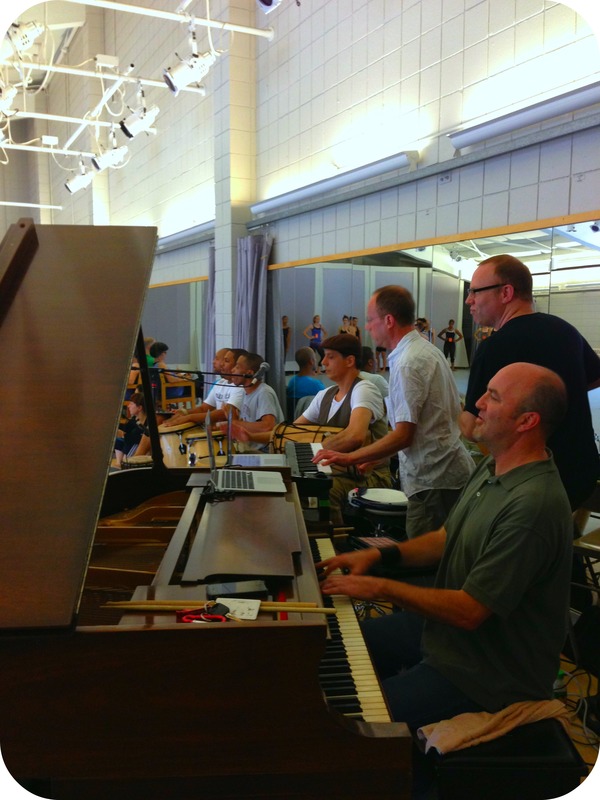 We had a ton of fun at our placement class, partly because we had all the musicians in one place to jam for us! In Heidi’s class the other day, we were working on a tough combination that included a lot of direction changes and deep lunges. She stopped class and asked us to really inhabit the music Glen Fittin had created for us. Locking into the deep drum beats for our legs and feet and finding the lyricism in our arms and torso, as we change directions. “Listen to the information the musician is giving to you,” she kept telling us. Reminding the class that Glen is watching and building along with us. The partnership between musician and dancer is even more apparent in Afro-Carribean class. Each day, Osubi Craig and Kwame take a few moments to teach us what is happening on the drums. We talk about how to count the music, what cues to listen to, where the music comes from and the tone of the music. The interconnectiveness of the movement and music is a huge part of what they teach. Osubi and Kwame teaching the class about Brazilian music and dance. 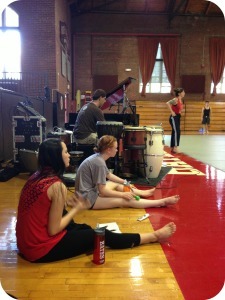 When a student is injured and observing class they are always encouraged by the accompanists to add to the percussion. I have seen Shamou hand maracas, bells and chimes to students, getting them to add to his score in class. 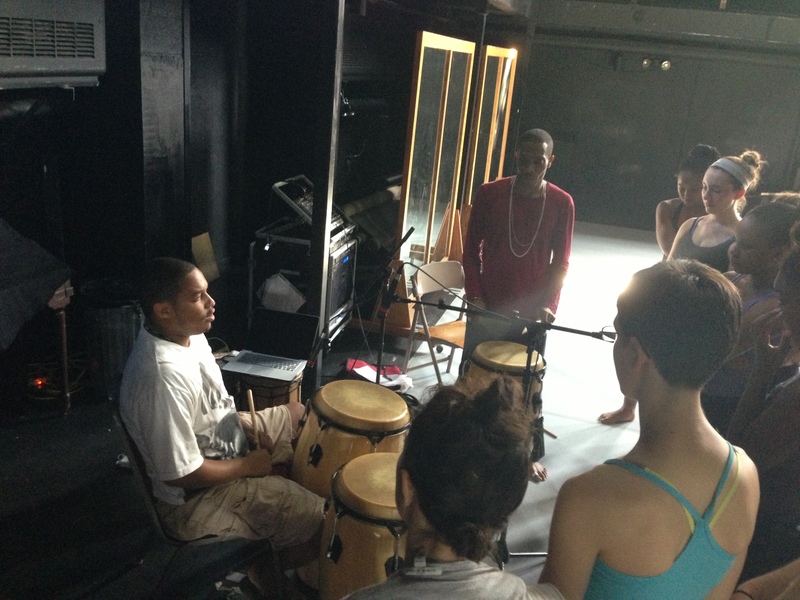 Shamou and his percussion assistants in Kendra’s modern class. I am sure this is only my first post of many, about our musicians. There is just too much to say! This Friday, in Afro-Carribean we will be drumming along with Osubi and Kwame. And on July 31st, you will have the opportunity to see many of our accompanists perform at the Musicians’ Concert.